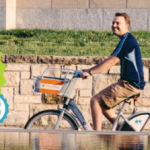 Thrive Allen County is hosting a bike-themed Portland Alley PedalFest Sept. 9 – 11. The three-day family-friendly event will feature camping, bike-in movies, trail bike rides, BBQ, beer garden, live music and much more. Riders will experience amazing singletrack rides on the new Lehigh Portland Trails. 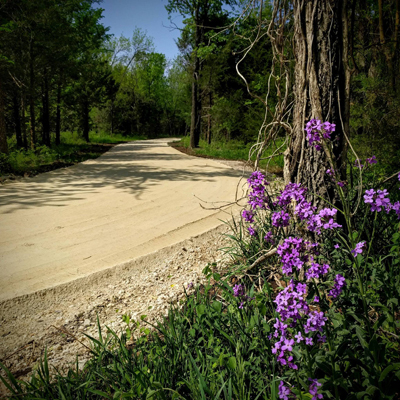 Kansas' 'King of Trails' welcomes you to try out the Southwind Rail Trail. 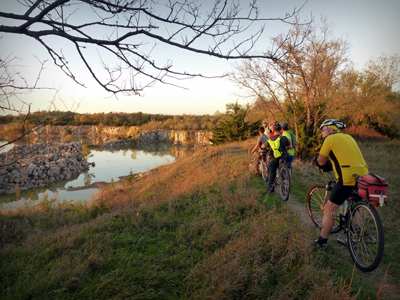 Lehigh Portland trails will treat you to views of Kansas' signature beauty. Bring your friends and family to what's sure to be a super weekend! Establishing a culture of health in a small community takes many ingredients. One of the most important is making active living normal—a regular part of daily routines for people in overalls or blue jeans as much as for people in spandex. When people see an adult male on a bicycle, we want the assumption to be that he’s riding by choice—not that his car is broken down or that he had his driver’s license revoked. 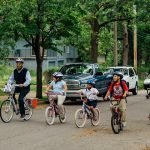 Thrive Allen County created Portland Alley Pedalfest to re-establish the bicycle as part of everyday life for ALL our residents, much as it was when we were kids! A celebration of all things bicycle-related, Pedalfest aims to rekindle the love of the bicycle using a variety of rides combined with a healthy dose of music, movies and community. 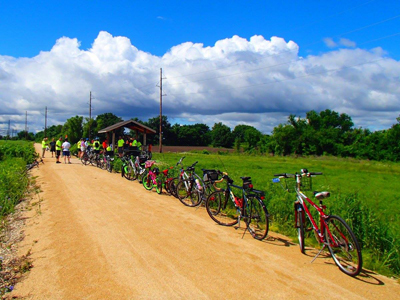 Routes take riders on the Southwind Rail Trail between Iola and Humboldt; longer routes continue through the communities of Chanute, Erie, Stark, Savonburg, Elsmore, Moran, Mildred, Kincaid and Colony, with 100-mile riders finishing up on the Prairie Spirit Trail. Each community will offer rest stops with water and food. The communities of Humboldt, Chanute and Elsmore will have community events going on, too—a city-wide garage sale, Mexican Fiesta, and Elsmore Days—giving cyclists lots of opportunities to explore some great Southeast Kansas communities. After the Saturday rides, Iola’s Riverside Park will be the center of activity, with terrific local BBQ, a beer garden sponsored by Rookies Bar and Grill, and live music featuring Tate McCoy, Steve Strickland, Emma Piazza and Pompous Jack through the evening hours. We’ll also have massage therapy available to help our cyclists work out the kinks after their rides. Inflatables will be available for kids to jump around in and burn off energy from 3:00 – 8:00 PM. 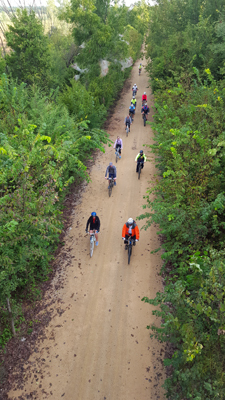 Sunday features self-guided bicycle tours of the surrounding countryside and an opportunity to experience amazing singletrack rides on the new Lehigh Portland Trails. Participants may camp at Riverside Park on Friday and Saturday nights, with showers, restrooms, water and free Wi-Fi provided. Thrive Allen County is excited to host the second annual Portland Alley Pedalfest and hope you are able to join us for a weekend full of biking, camping, music, food and making memories! For up to date information on the Portland Alley Pedalfest visit our Facebook page: www.facebook.com/portlandalleypedalfest For more information about bicycling in Allen County, visit ThriveAllenCounty.org, BikeAllenCounty.org or follow Thrive Allen County or Bike Allen County on Facebook.